In this guide, Node 1 & 2 are the loan kit. Node’s 3 & 4 will eventually become the only nodes in the cluster. 1.3) (If required) Sanitize disks on nodes 1 & 2. Note: Cannot sanitize disks used by root aggregates, and recommend still keeping at least 1 spare. 1.4) Migrate data LIFs to nodes 3 & 4. Note: This includes SAN LIFs which can be moved if the LIF is administratively downed first. For SAN LIFs be sure to check Selective LUN Mapping before moving SAN LIFs. 1.5) Verify cluster is healthy via AutoSupport Health Summary/Config Advisor/other means, and remediate any issues. 2.3) (If required) Zero the disks used by root aggregates on the loan kit. 3.3) Disconnect cables from Clus1 ports and direct connect. 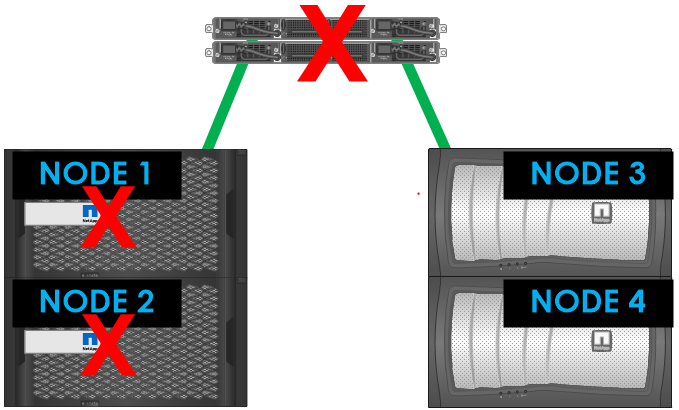 3.7) Disconnect cables from Clus2 ports and direct connect.